EnviroOne, in partnership with local micro-financing organizations, frequently meets with farmers, petty traders, teachers, etc., in different parts of Sierra Leone to evaluate needs, and educate beneficiaries on the micro-finance process. The program is helping people and the community in many ways. Fishermen: With micro loans negotiated by EnviroOne, fishermen are able to repair their fishing boats and nets with significant increase in profit margins. Crop Producers: Microfinance is helping land owners secure labor to work the land, acquire the needed inputs, grow crops and realize huge profit returns. 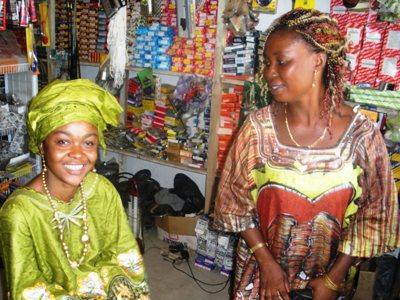 Petty Traders: Microfinance is enabling petty traders to take group micro-loans (below left) and start or grow existing business. Pictured above and to the left are two of many success stories we are very proud of. An EnviroOne microfinance adviser (middle) smiling at the success of a client that has gone from an empty store to a very thriving business. To far right is an EnviroOne social welfare expert smiling at the success of a petty trader who is now giving hope for a better life to her handicapped elderly relatives. Teachers: Profits from microfinance enable parents, who otherwise cannot pay school fees or buy school uniforms, to send their children to school. Teachers (not normally paid on time or not paid at all for very long time) continue to teach uninterrupted using micro salary loans negotiated by EnviroOne.